Crooked Lane Books, 9781683314622, 304pp. Three months. That's how long ER nurse Frankie Stapleton has agreed to stay in her sleepy little hometown of Stillwater, helping her estranged sister save the family hardware store, working a few shifts at the local hospital, and most importantly, rebuilding the bridges she burned on her way out of town twelve years ago. When a pregnant car crash victim arrives at Stillwater General, Frankie and the team race to save both mother and child--but only the baby lives. Rumors swirl that the accident was deliberate, and Frankie's horrified to realize that she let the driver escape. But why would anyone want to kill Kate Tibbs, a social worker and the wife of an up-and-coming local politician? Frankie's investigation turns up plenty of motives, from revenge to dirty politics, and even more suspects. There are secrets in Stillwater, and she's determined to uncover them, even if it means involving her loved ones for help. But when the baby disappears, her search for the truth becomes a desperate, deadly race against the clock. 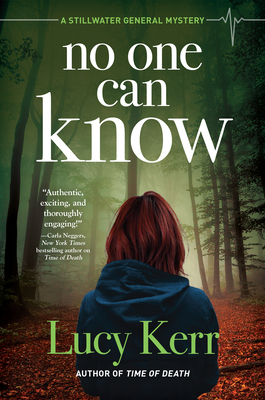 No matter the cost, Frankie must piece together the truth to stop a killer and save a tiny life in Lucy Kerr's riveting second Stillwater General Mystery, No One Can Know. Lucy Kerr lives outside of Chicago with her family, her cat, and many, many piles of books. She likes strong coffee, rainy days, old buildings, and fresh-baked cookies, but she likes telling stories best of all. This is her second Stillwater General mystery.